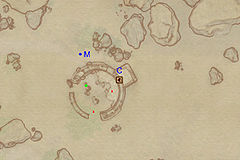 Fort Strand is a medium-sized fort east of Anvil containing marauders (quest-related). It contains two zones: Fort Strand and Fort Strand Great Dome. 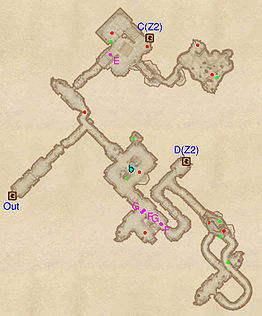 If you enter this dungeon without having started the associated quest, your journal will recognize Rockshatter, the weapon carried by Bjalfi the Contemptible, and add the related quest. This location's map marker (M on map) is named Fort Strand (editor name FortStrandMapMarker). The entrance door is ESE of the marker, 80 feet away. 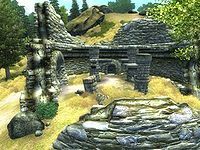 Upon entering Fort Strand, the first tunnel quickly divides into two, forcing you to make a choice early on; either head for door C or D, as they will both lead you to your main objective, Bjalfi the Contemptible, who resides in Fort Strand Great Dome, be wary however as a marauder may patrol the split tunnel . It is possible to reenter this zone from both exits, so simply pick the eastern passage through the old wooden door. The next room contains a couple of minor loot chests and up to three enemies, depending on whether or not you encountered the patroller, so proceed carefully and avoid the two pressure plate traps and rat at F. Proceed through the gate, down the stairwell and door D will be right ahead of you. 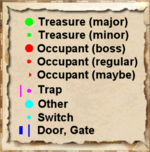 Taking a small detour will net you additional treasure, so head into the cave-like structure east of the door. A bonfire will light up a deep pit connected by a few wooden planks. Stick to the left and stay on the ledge, then head up the first set of planks. Follow the tunnel to a hallway with a chest, then take the next tunnel all the way to the bottom of the pit and kill the opposition guarding two chests. Backtrack all the way back to door D and enter Fort Strand Great Dome. 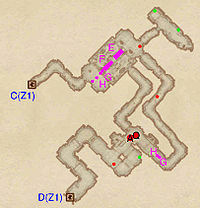 When you return to this zone from door C, be prepared for a fight against a Marauder Battlemage and an archer and explore the northeastern room for a locked chest. On your way back to the very first intersection, avoid the swinging log trap at E and backtrack all the way to door Out. In the Great Dome, head down two sets of stairs until you arrive in a large room; this is the lair of Bjalfi (Q), a boss leveled Marauder and a campsite Marauder at A. Dispose of them and loot Bjalfi's corpse for Rockshatter. Pick the stairs leading to the southeastern entrance, avoid a pressure plate (H) and a swinging mace trap at G and follow the tunnel until you arrive in a large room in two levels. Take a detour and explore the northeastern room for two minor loot chests. Cross the bridge and avoid falling down as a crumbling bridge trap (E) will make the first part of the bridge collapse and two rotten planks at F will take care of the second part. Finally, exit through door C to the first zone, Fort Strand. Esta página foi modificada pela última vez à(s) 08h20min de 14 de outubro de 2013.